Rocky Mountain Pottery Barn meets charm and sophistication in this mountain contemporary home well located in popular Conifer Meadows.Vaulted ceilings with wood beams and tongue and groove ceiling is flooded with natural light.Updated kitchen with 5 burner gas stove, 2 ovens,pull out spice rack and pantry shelves with oversized granite island create a chefâs dream.Knotty alder doors and trim 2 gas fireplaces to create that warm cozy feeling. Romantic Master bedroom in upstairs loft along with updated full bath.2 main floor bedrooms with updated Â¾ bath and open inviting living room with slider to deck creates the perfect entertaining flow. Lower level offers family media room,wine room, bedroom, laundry room, Â¾ bath and abundance of storage. 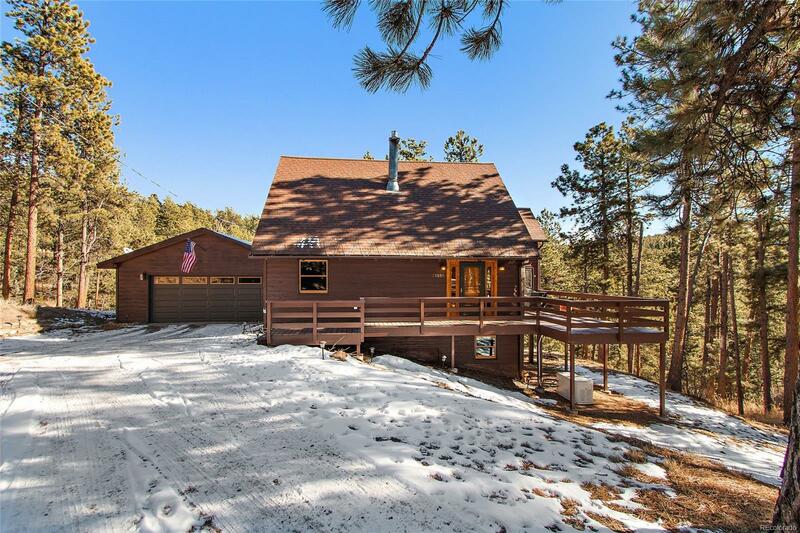 A little over 3 acres of privacy and usable land where you hear only the pines swaying in the wind.Itâs a Colorado home that just exudes comfort and charm. All located within 4 minutes of HWY 285 and shopping,schools and restaurants in Conifer.